(Oregon Coast) – All that really rugged beauty you find on the Oregon coast had its genesis in something frighteningly fiery and cataclysmic, millions and millions of years ago. Actually, numerous cataclysms, over and over. It's hard to imagine now, but it took a series of apocalypses to get to the Oregon coast we all know and love. (Above: Manzanita). 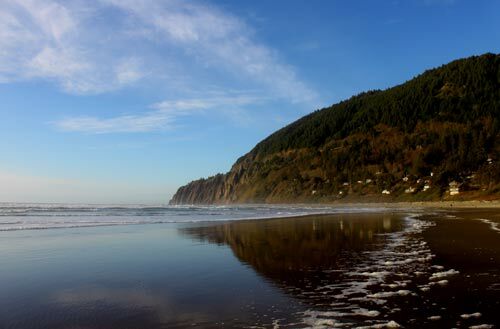 The towering, engaging shapes of Tillamook Head, Cape Lookout, Cape Perpetua and Neahkahnie Mountain, down to the smaller oddities you see sticking out of the sands: each has a violent story to tell. Many come from an unimaginably huge series of lava flows, hundreds of miles long, while others are the result of ancient volcanoes right here. All these blackened wonders are basalt rock – basically lava that has cooled into these shapes. Geologists say some are easily as old as 40 million years, while a large portion of landmarks are toddlers by comparison, at 15 millions years or less. Most of the latter age group come from a weak spot in the Earth's crust that still exists today: that which fuels Yellowstone National Park. It was once before a super volcano (and will be again) which is so big it has the capability of ending life on Earth. But 15 million years ago, with the movement of tectonic plates, that weakness was about where Idaho is right now. At that time, over several million years, various super eruptions happened that spread lava hundreds of miles westward, creating lava flows sometimes 10 to 30 feet high. Back then, much of Oregon's land mass didn't technically exist, so all that lava wandered off the edge of the continent (which ended about where Silver Creek Falls State Park is now) and into the prehistoric ocean. These are known as the Columbia Basalts, as they also created the basics of the Columbia Gorge. All that land (and ocean floor) rose and fell a few times, and a lot happened to those basalts. Cape Foulweather, Cape Lookout, Yaquina Head and Cape Meares were the result of these flows filling up huge canyons that existed at the time. Eventually, these spots rose and fell over the 15 million years, several times over, and the canyon stuff around the cooled basalt eroded away, leaving just the black rock – a bit like a molding cast. Eventually, erosion took its toll on these areas as well, especially by the sea, whittling them into the shapes we gawk at - the towering cliffs and headlands that attract tourists and whale watchers. Neahkahnie Mountain and Tillamook Head were something a little different and more surprising. These eruptions were so powerful they would burrow down into softer sediment and then come back – re-erupting elsewhere. They are called intrusive basalts, because they intruded down into the Earth's sediments and softer material and re-erupted. 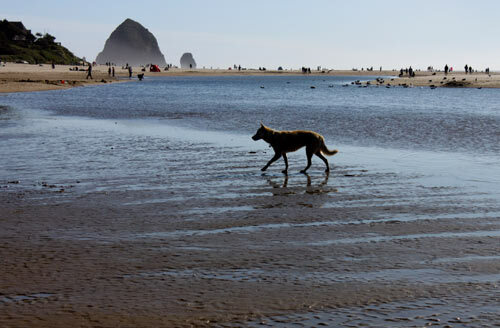 This kind of eruption created a lot of the smaller rock structures we know, such as the famous Haystack Rock at Cannon Beach, the other Haystack Rock at Pacific City and Twin Rocks at Rockaway Beach. Other major landmarks have their own separate story. According to Seaside-area geologist Tom Horning, Cascade Head – near Lincoln City – was its own volcano. So was Cape Perpetua near Yachats. It seems Cape Perpetua was a massive volcano likely fueled by the soft spot (where Yellowstone exists now). Another theory has it that it there was another fault line around this area that funneled magma into the volcano, but petered out around 40 million years ago. In either case, the volcano that is now Cape Perpetua - and other volcanic flows beneath the ocean and nearby - all happened right about that time. 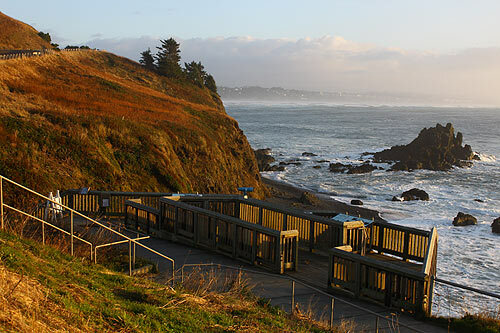 Cascade Head near Lincoln City is also one of these from the same time period. 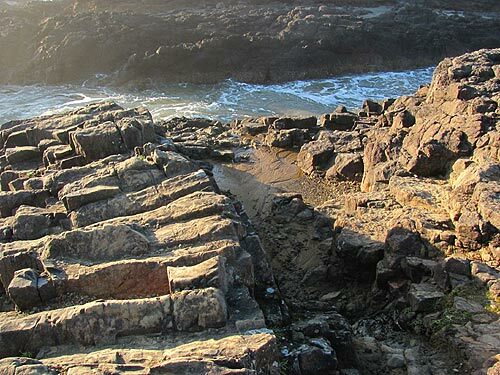 Some of the most curious of rock structures on the Oregon coast are those that look like steps. Geologists sometimes call them “cordwood joints,” in reference to their appearance and their origin – also a fiery one. These unique structures come from eruptions that continued over and over again, which meant sometimes one lava flow would interact with or cover over another previous one, one that was already a cooled basalt structure by that time.